About a dozen narcotics officers and several patrol officers responded to a residence where police suspected drugs were being sold, Acevedo told reporters Monday night. The narcotics officers announced themselves as they breached the front door shortly before 5 p.m. Then the gunfire started, Acevedo said. “Immediately upon breaching the door, the officers came under fire from one or two suspects inside the house,” the police chief said. One suspect retreated to the back of a room, he said, then re-emerged and returned fire. 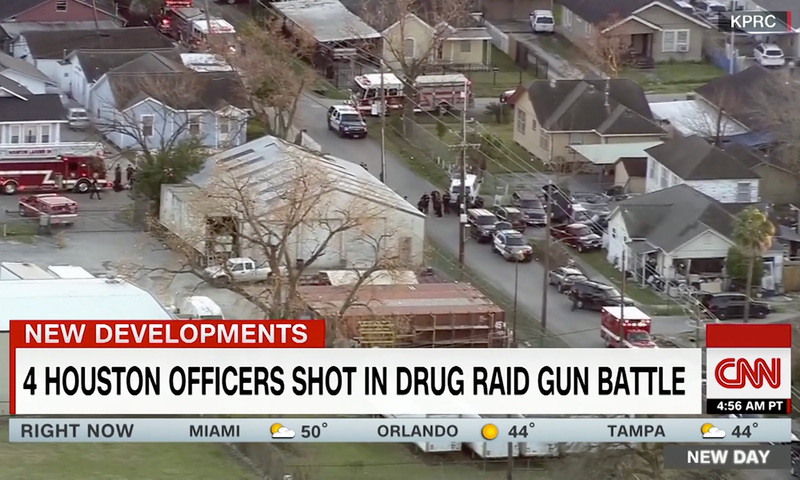 Police returned fire, killing two suspects at the scene, the chief said. He did not release the suspects’ names. Acevedo said authorities first believed five officers were shot. Three of the four officers who were shot are still hospitalized, police said Monday night. The officer who suffered the knee injury was also being treated at the hospital, police said. Two of the hospitalized officers are in critical condition, while the other two are in good condition, police said. An officer who was discharged suffered a gunshot wound to the shoulder.